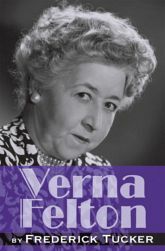 Today Verna Felton is most remembered for the voice characterizations she created for six Walt Disney features, but this biography reveals a varied career spanning sixty-five years. Twice nominated for an Emmy, Verna endeared herself to TV audiences of the 1950s as Hilda Crocker on Desilu's December Bride. Before that, she was in constant demand as a radio voice artist, supporting the likes of Jack Benny, Judy Canova, and Red Skelton. Fredrick Tucker chronicles her rise to fame, from phenomenal child actress to her final quarter century as one of Hollywood's most beloved character actresses. The book also features an abundance of rare photographs and several appendices, including a never-before-published episode guide for December Bride.